Word had spread amongst the tribal leaders in the Faranox dimension of the human raid on one of their towns in which many of the Agaronin were killed and all of their slaves were freed. Now, five tribal leaders have banded together and are starting work on a massive new settlement in order to better defend against the human threat. Each tribal leader had brought all of their Agaronin and all of their slaves to help build the massive new village…however, they made one huge mistake. 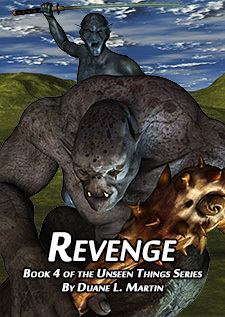 They attacked the village of the blue fins that the humans had befriended, damaging buildings and taking over half of the village’s population as new slaves, leaving their newest team member, a blue fin named Freddie and his human friends looking for revenge, but they were going to have to be smart about it. Derek had planned the first attack, and now it was up to him to plan a brand new one on a scale he’d never imagined. With the help of the entire team, most of their parents, their friends and the rest of the blue fin villagers, they were going to have to take out an enemy threat that had them outnumbered by fifteen to one while rescuing all of the slaves and the blue fin villagers in the process. Many other life changing events await them as well, including more new team members, a new house, new revelations about the origins and purpose of the blue fin people and a rep that’s suddenly breaking centuries old protocols to make personal contact with them. 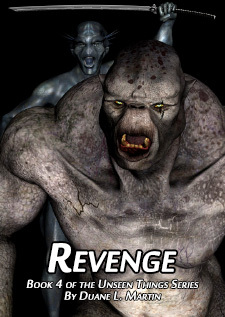 Revenge is the fourth book in the Unseen Things series. Note: This purchase includes the Epub, Kindle (mobi) and PDF versions of the book.